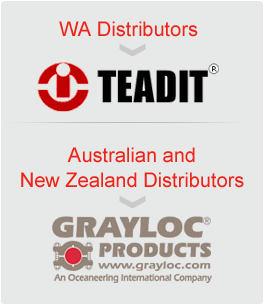 TEADIT expanded graphite sheets are produced from pure, expanded flexible graphite and do not contain any other fibers or filler materials. TEADIT style NA-1002 is a compressed non-asbestos jointing-sheet material produced from Aramid fibres, bonded with Nitrile rubber (NBR). It is being manufactured by means of a hot calender process under rigorous quality control standards which are registered under ISO 9001 certification. TEADIT style NA-1040 is a non-asbestos jointing-sheet material produced from cellulose fibres, bonded with Nitrile rubber (NBR). It is being manufactured by means of a hot calender process under rigorous quality control standards, registered and certified under ISO 9001. TEADIT style NA-1100 is a universal jointing sheet with high temperature and pressure resistance, manufactured from graphite and carbon fibre, bonded with Nitrile rubber (NBR). It is manufactured by means of a hot calender process under rigorous quality control standards which are registered and certified under ISO 9001. TEADIT style NA-1005 is a compressed non-asbestos jointing-sheet material produced from Aramid- and cellulose fibres, bonded with Nitrile rubber (NBR). It is being manufactured by means of a hot calender process under rigorous quality control standards which are registered under ISO 9001 certification. TEADIT 24SH is a large gasket sheet produced from 100% pure, multi-directionally expanded PTFE (Polytetrafluoroethylene). TEALON TF1570 is a structured PTFE – Gasket – Sheet manufactured by a unique process which provides a high level of fibrillation to overcome the creep relaxation and cold flow problems associated with normal (skived or moulded) PTFE sheets. TEALON TF1570 is produced from virgin PTFE resin filled with hollow glass micro spheres. TEALON TF 1580 is a structured PTFE – Gasket – Sheet manufactured by a unique process which provides a high level of fibrillation to overcome the creep relaxation and cold flow problems associated with normal (skived or moulded) PTFE sheets. TEALON TF1580 is produced from virgin PTFE resin filled with Barium Sulfate. TEALON TF 1590 is a structured PTFE – Gasket – Sheet manufactured by a unique process which provides a high level of fibrillation to overcome the creep relaxation and cold flow problems associated with normal (skived or moulded) PTFE sheets. TEALON TF1590 is produced from virgin PTFE resin filled with Silica.